Gulkand (Rose Petal): This ice cream is made with rose petal preserves, a cool treat for a hot summer day. Falooda: Ice cream flavored with bits of falooda and basil (tukmaria) seeds. Lychee: Experience the uniquely different, sweet and refreshing flavor of lychee. ButterScotch: An all time favorite of Indians, sweet buttery flavor, candy bits swirled with butterscotch syrup. Classic Indian (Malai): Creamy ice cream with delicate aroma of cardamom and rose water. Enhanced with bits of pistachio and almonds. Mango: Soft and delicious mango ice cream made with highest quality Indian mango pulp. Pistachio: Our pistachio ice cream, delicate and not too sweet. 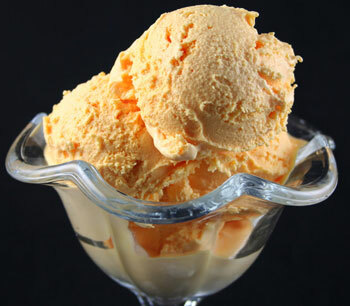 Royal Saffron (Kesar Pista): Made using the purest Spanish saffron, this ice cream is a pure delight for saffron lovers. Coconut: A lightly sweeted tropical delight with soft coconut bits. Strawberry: A swirl of strawberry in every bite. Vanilla: Traditional Vanilla ice cream with a touch of Indian flavors for a unique taste. Chocolate: Traditional Chocolate ice cream with a touch of Indian flavors for a unique taste. Choco-Vanilla: Traditional vanilla ice cream with chocolate bits, this is a kids favorite. Tutti Frutti: Soft ice cream enhanced with a fruity flavor and bits of fruit. Pineapple: Soft pineapple ice cream with bits of pineapple for a true tropical delight.